Bad Staffelstein (Germany) (AFP) - Hungarian Prime Minister Viktor Orban on Wednesday rejected what he called German Chancellor Angela Merkel's "moral imperialism" in Europe's migrant crisis. When asked what he expected from Merkel while Europe grapples with an influx of asylum-seekers, the hardline leader grinned: "I have a long list." Orban accused Merkel of trying to impose her vision of an open EU on the rest of the bloc. "The most important thing is that there should be no moral imperialism," he said during a visit to the southern German state of Bavaria. Orban, speaking ahead of an EU summit in Brussels later Wednesday, said his country had a "democratic right" to a different approach. The summit takes place amid a growing east-west split within the bloc after ministers forced through a controversial deal Tuesday to share out 120,000 refugees. "I don't doubt Germany's right to define its moral obligations for itself. They can decide if they accept every refugee or not... (but) that should only be compulsory for them," Orban said. "We are Hungarians however, we cannot think with German minds. Hungary should have the right to control the impact of a mass migration," he said. "The Hungarian people don't want this, we ask that the wishes of Hungarians be respected." Orban revived recent proposals in what he called a six-point plan to resolve the crisis. They included persuading Greece, one of the EU countries on the front lines of the migrant influx, to hand over control of its borders to EU countries willing to help police them, as well as separating asylum-seekers from "economic migrants" before they reach the passport-free Schengen zone. Orban said he would also press fellow EU leaders to agree on a common list of safe countries of origin to which migrants can be returned, and to pitch in one percent of their EU income and their EU contributions to an emergency fund. He urged the bloc to work closely with key non-EU countries playing a key role in the crisis such as Russia and Turkey, and the creation of a global system of migrant "contingents" for countries to take in. Overriding opposition from eastern European states, including Hungary, interior ministers approved plans Tuesday that require all to take their share of the hundreds of thousands of migrants who have overwhelmed states such as Greece and Italy. The deal was widely seen as a victory for Berlin in the German media, just as Germany expects up to one million asylum-seekers this year and has been clamouring for "fair" distribution of migrants throughout the bloc. In response to the influx, Hungary has closed its border with Serbia and introduced draconian laws to punish those crossing into the country illegally. 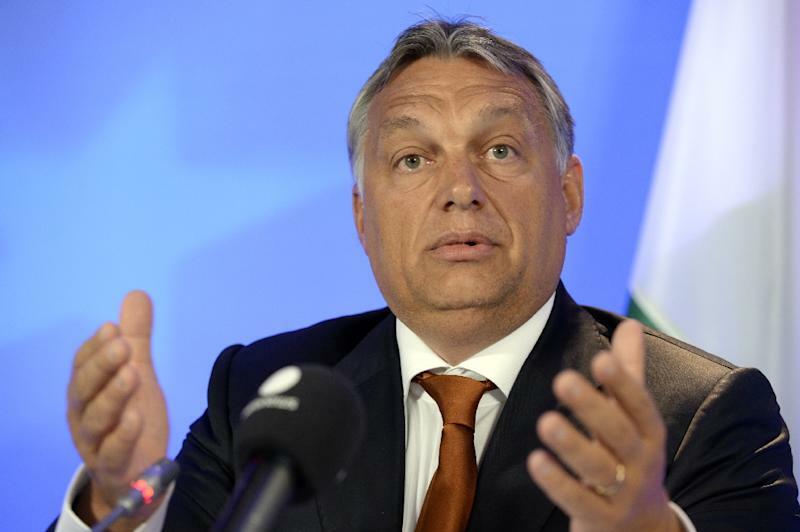 Orban said Wednesday that he would only consider voluntary measures to accept asylum-seekers. "Quotas and contingents are two different things. We reject the former, but are ready to discuss the latter," he said. Orban was invited to Germany by one of the most vocal critics of Merkel's migrant policies within her conservative bloc, Bavarian premier Horst Seehofer.